OE-Mail Recovery (download) is an easy-to-use tool that allows you to open .dbx files, read dbx files and restore your damaged Outlook Express data. It recovers corrupted emails and news messages and saves them in format that can be easily read by any email client. This software is easy to use and has a simplified user interface, very friendly to beginners. Not need a special knowledges to open dbx file with OE-Mail Recovery. In order to find out this just download this powerful email recovery software now! 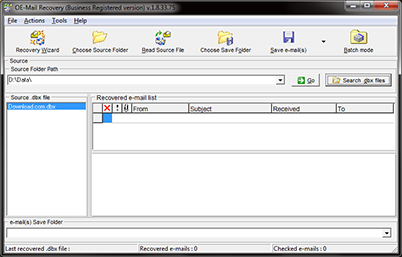 OE-Mail Recovery is powerful software for read .dbx files (opening Outlook Express dbx files) and retrieving information in the popular mail program - Outlook Express. Program to open dbx files (opening Outlook Express dbx files) makes it easy to recover messages from broken dbx files (the files used by Outlook Express to store mail). Opening .dbx files (opening Outlook Express dbx files) available without use DAO/ADO and so on. Just double-click on a file for an opening .dbx files. The dbx open tool scan dbx files easy and quickly. The software can recover and extract your e-mails in damaged mailboxes of Outlook Express. Outlook Express failures, power outages or viruses can destroy the important data on your e-mails and you won't be able to open dbx files or read Outlook dbx files. Why would you have to backup or even lose all you existing email messages (together with address book, mail rules and all other email data) every time your system crashes or you re-install Windows? Now you can use OE-Mail Recovery for reading dbx files and opening dbx files. After system crash or serious damage, simply use Outlook Express recovery software and your data will be back immediately! (odzyskiwanie dbx tool). Outlook Express email problems can arise occasionally when checking for email. What can you do you if Outlook Express doesn't behave as you expect and it can't read Outlook dbx files or open .dbx files? Simply use the dbx open tool - dbx read software - retrieving dbx files tool. The program to open dbx files can cope with the task of opening dbx files and reading dbx files when Outlook Express itself cannot read dbx files and when a range of other programs are not capable to restore the information contained in these files. These situations can happen because of viruses, computer breakdown, power interruptions and many other reasons, leading to errors in the file system and your Outlook Express crash. OE-Mail Recovery is the dbx read tool. OE-Mail Recovery is like insurance for your Outlook Express important data. If suddenly you can't see any emails in an Outlook Express folder and can't open .dbx files in Outlook Express - How to open a dbx file or read .dbx files? Simply download OE-Mail Recovery Software. 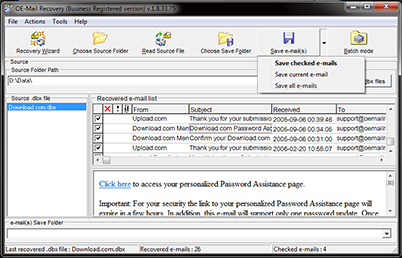 The tool read Outlook Express dbx file and extract a recovered messages from it. The software read Outlook Express dbx files without use a special components. OE-Mail Recovery can read DBX files of Outlook Express version 5, 5.5, 6. The dbx open tool can answer on a questions: How to open a .dbx file? How to open a dbx file? How do you open a dbx file? OE-Mail Recovery allow open dnx file of Outlook Express without a special drivers, tools, DAO. OE-Mail Recovery don't use MAPI to open Outlook Express dbx files. Just double-click on a file for an opening dbx files. Customers can view a messages in OE-Mail recovery after an opening .dbx files (odzyskiwanie dbx tool). 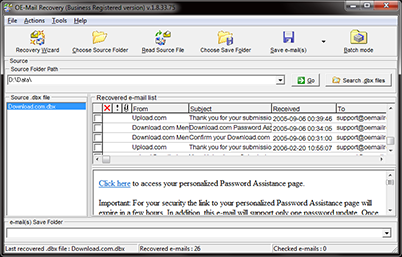 The dbx file reader allow to view content of damaged Outlook Express folders: messages, news and so on.